Sorry another late post from me today. Why is it I seem to be chasing my tail all the time???? Never mind, as I always say........better late than never! So today I thought that I would show you a card that I made using new products on my website. The stencil beeing ....... did you get that? Sorry, my humour is so lame! Now I looove bees, I studied them at school and they are gorgeous little things that do fantastic things in our world and are so fascinating. I am not a lover of flying insects, you get a wasp near me and I hate it as they just annoy you but get a bee around me and I am happy as larry! 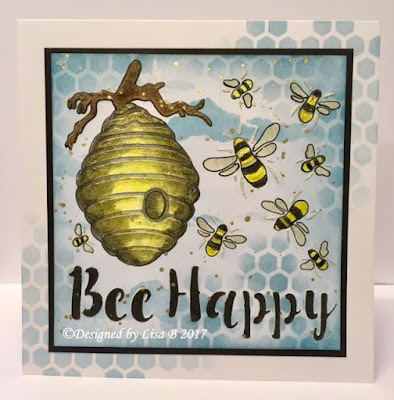 Anyway when Sue ( from Imagination Crafts ) showed me this new design I was thrilled as I knew I would love using it and do you know what.....I did. It is a lovely stencil that you can use as a whole as I have below or you can just take elements from it and I love that as I know I will use it for many uses. I used Imagination Crafts Structure Paste initially to add some dimension through the stencil on to the card. 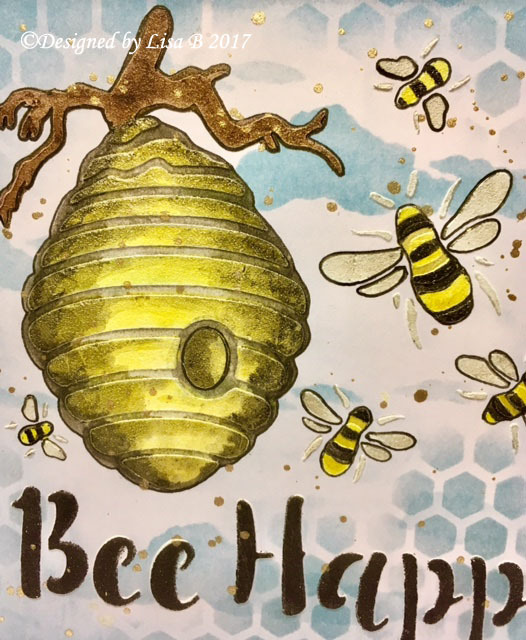 Once it was dry I used some Tumbled Glass Distress Ink through an Imagination Crafts Honeycomb Stencil to add some background interest and also used some torn copy paper to create some clouds. I then filled in some areas of the stencil with a paint brush adding more detail and shading and then finished off by adding some detail around the outside with a Permanent Micron Pen. I also added some splatters to the background with watered down White Gold Starlights and a paint brush and then added some detail to the card blank as well with the distress ink and honeycomb stencil. Have a fabulous week and I will see you all soon.